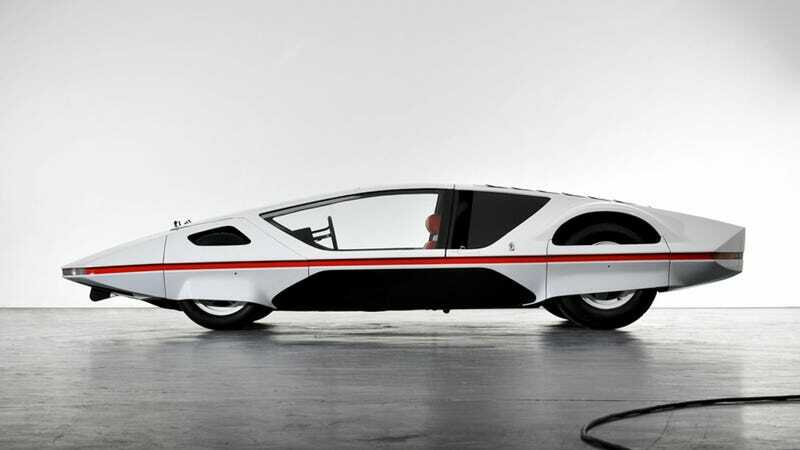 Underneath this wild Pininfarina-designed body shell sits a Ferrari 512S race car chassis. Built in the early 1970s, this car was toured around the show circuit as a concept for future design elements before it was retired to a life as static art display in the Pininfarina offices. Just four years ago, Ferrari mega-enthusiast Jim Glickenhaus was able to convince Pininfarina to sell him the car. His plan then was to get the car back into running and driving condition. Designed by Paulo Martin, the body on this 512S is one of the most bizarre looking cars in history, with open fender tops, the most wedge possible, and headlamps that disappear into the front bodywork. Ferrari, to compete in the 5-liter Sports Car class at Le Mans, was forced to build twenty five Porsche 917 competing 512s, but only sold 22 of them. This car was the 23rd chassis built, and it was handed off to Pininfarina because what else do you do with a defunct race car that has never raced? When Pininfarina first built the car, it was capable of fore and aft motion, but couldn’t really drive as it had no steering. Glickenhaus and his team, then, had their work cut out for them. On Friday, Scuderia Cameron Glickenhaus posted video of the Modulo going for a quick spin essentially for the first time in its existence. After four years of work, rework, and extra work, this Ferrari-based concept is now roadworthy, if not explicitly road legal. This is certainly a better outcome for the car than to have sat at Pininfarina for ages doing no more than looking good.